On Thursday 22nd of November, Pieter van der Wal, Harbour Master of Groningen Seaports welcomed the 16000th guest of the Seafarers Mission this year. He welcomed the guest together with the board. The lucky guest is Eimantas Grabauskis from Latvia. Having more than 16000 guests is a new all-time record. It is a regular evening in Eemshaven as Eimantas Grabauskis from Latvia, crew member on the tender MCS Boreas, visits the Seafarers Mission. The Harbour Master of Groningen Seaports, Pieter van der Wal, welcomes him in the Mission with a speech and a plaquette mentioning this unique event. Mr. van der Wal also hands him a tie, coat of arms and a book about the harbours in the area. On behalf of the Seafarers Mission, he received a welcoming package with some life essentials and souvenirs from chairman Bert Hoekstra. Afterwards there was time for food and drinks. 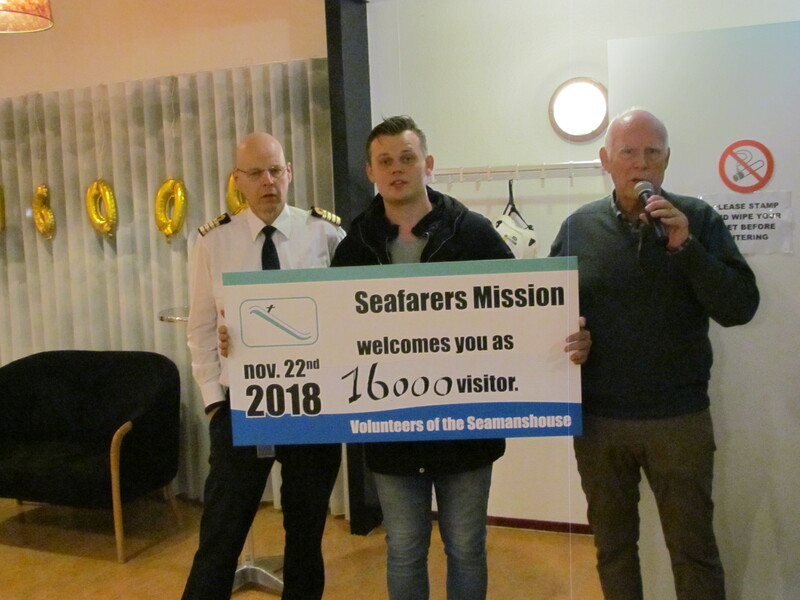 Being active in the Eemshaven ever since 1999, the Seafares Mission sees a slow growth in the amount of guests visiting the Mission each year. Up until 2017 the average guest count layed around 10000 – 12000. This years record comes mainly due to expansion of the harbour. Due to its location, many companies building and maintaining wind farms at sea choose Eemshaven as their base. Another reason of this years record can be found when looking at cruise ships. Being built in Papenburg, Germany, they are moved to Eemshaven for completion and sea trials. This too brings a lot of personnel and a lot of guests.